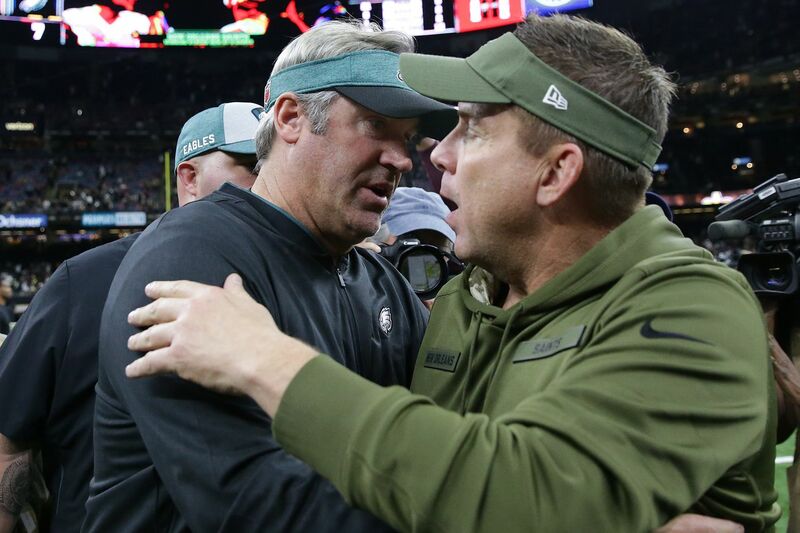 Eagles coach Doug Pederson, left, and Saints coach Sean Payton embrace after the game. METAIRIE, La. — One indication of the level of Sean Payton’s talent is that, right now, very few people seem to be talking about Sean Payton’s talent. A lot of Eagles fans will snicker at that notion, because snickering is what a lot Eagles fans do. They’ll point to the playoff flameouts. They’ll point to the presence of Drew Brees. They’ll point to the seemingly endless supply of skill position talent that Payton has enjoyed in his 13 seasons with the Saints. It ain’t the coach, they’ll say. News flash: It most definitely is. In fact, it is the biggest reason to worry that the Eagles’ magic might finally run out on Sunday afternoon. I say that with all due respect for Doug Pederson. More of it, in fact, than most have bothered to pay the Silver Fox over the last few seasons, present market included. Maybe it’s a function of the job: A head coach’s lot is all of the worst parts of playing quarterback. He gets all of the blame and none of the credit. When the Eagles are winning all we hear about is Nick Foles and Carson Wentz. When they are losing, all we hear about is how Doug Pederson couldn’t coach a cat to land on all four feet. In that sense, the run-up to Sunday’s Saints-Eagles tilt has been par for the course. As someone who has spent parts of the last three days wandering around the Saints locker room, I can tell you without qualification that Big Trick Nick is officially a nationwide phenomenon. “The Foles magic is real,” New Orleans defensive lineman Sheldon Rankins said at one point. I’m sure the same has been true up in Philadelphia, where the Eagles need no reminder of the greatness that is Drew Brees. Both of his postseason starts against them have ended in a fashion that was, shall we say, less than ideal. All told, Brees is 6-3 in his career against the Eagles. More pertinent, he is coming off a 48-7 thrashing of the Birds in which he threw exactly eight incompletions compared with four touchdown passes and 363 yards. Brees is a good quarterback. I don’t think I’m breaking any news there. The guy will be 40 years old on Tuesday, and he is coming off back-to-back regular seasons in which he posted the two best completion percentages of his career. I’m not suggesting that Payton get credit for Brees. What I’m suggesting is that he should not be debited for him. There’s a symbiosis between quarterback and coach that is necessary to reach championship heights. Pederson gave a nod to it recently when he credited his familiarity with Foles for the success that the two have enjoyed together. And, this week, Saints offensive coordinator Pete Carmichael referred to it on a couple of different occasions when talking about his team’s success since Payton took over. “By the time we get to Sunday, Drew and Sean have such a good feel together of what they are comfortable with, what’s been put in the game plan,” Carmichael said. That’s the big concern for the Eagles. In last season’s divisional round, Pederson was unquestionably the better play-caller and game-planner in a matchup with Steve Sarkisian, who lasted two seasons as the Falcons' offensive coordinator. In the NFC championship game, it was again no-contest against Pat Shurmur, who, for some reason, continues to get job opportunities. The two playoff games that the Eagles have played against real coaching staffs both came down to the last possession, one of them ending on a strip-sack, the other one ending on a double doink. Cheating death is something that does not continue forever. That’s a stone-cold fact. Payton? He’s a savant. He’s been shredding the Eagles since before he was a Saint. He’s been shredding them and everybody else since he became a Saint. He’s one of three play-callers to lead an offense that finished a regular season with 500-plus points three times. Bill Belichick did it four times. Mike Martz did it three times. Mike Shanahan is the only other play-caller who has done it more than once. It’s funny, though, because Pederson has a little of that magic in him too. I tend to think that Foles would agree. The guy had to play for Jeff Fisher. “It just wasn’t a good fit,” Coleman said. It’s the fit that matters. The Eagles fit against Sarkisian and Shurmur. They didn’t fit against Payton the last time they played them. You’re a fool if you count them out. But you are also a fool if you ignore the coach that they’re up against.